Do you know Yogi Tea? Yogi Tea and I are very good friends. We often spend time with each other when the weather is chill and there is recorded TV to catch up on. Last weekend, for example, we watched three shows of Strictly, cuddled up on the sofa together. In order to summon up Yogi, I boil a pot of water and then add a teaspoon of spice from a beautiful little package. It will make the whole house smell of coziness and comfort. I then add some milk. Well, a lot of milk. I like milky tea. I reheat my potion quickly and then strain it into a teapot that I have rinsed out with hot water. I place the pot over a tea light and pour myself a cuppa. I sweeten the tea with honey, stir, then wrap my hands around the warm vessel and inhale the fragrant steam. Off to the sofa me and Yogi go, to meet up with my other friend, blanket. 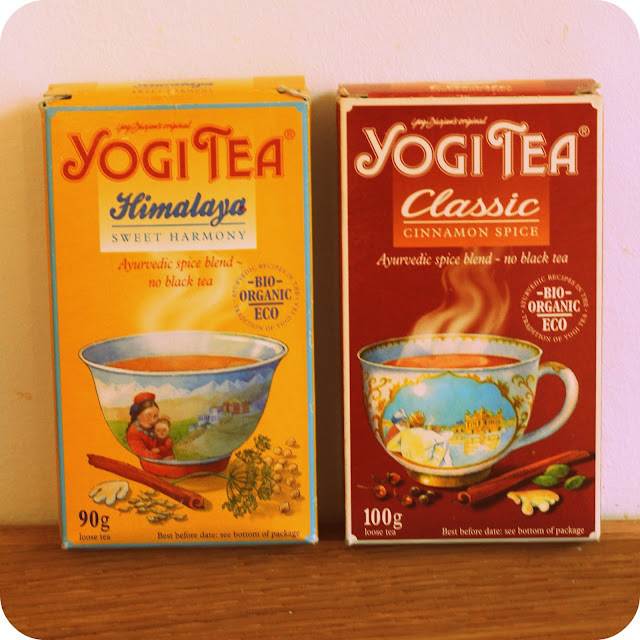 My favourite Yogi Tea flavours are the classic cinnamon spice loose tea and the Himalaya blend with ginger, but there are many other mixtures, either as loose teas or in bags. And I love the bags, too. They make tea time truly uplifting. The little labels at the end of the string come with inspirational quotes like "Your intuition is your best friend. ", "By honouring your words, you are honoured." or "Be proud of who you are." P.S. : Sadly, nobody from Yogi Tea is giving me any freebies for writing this post. I'm just really, really fond of their teas and thought I would shout that from the rooftops! I am not a tree drinker - but this post made me want a cup! well, obviously i do love tea. and i love your cuppa ritual very much. love how you have two buds, tea and your blanket. weather cooled down a bit. then warmed up a bit, and its looking cooler again, TEA and blanket time! YAY! Never tried them but I am missing my chai latte, maybe a yogi latte would fill the void.